​Beginners often get confused about watercolor paint. I remember when I first started painting I was bewildered by the huge range of hues, the different brands, the fancy names, and all those code numbers on the labels. A basic understanding of how to read this information is a great way to familiarize yourself with watercolors. So how do you read the labels on watercolor paints? 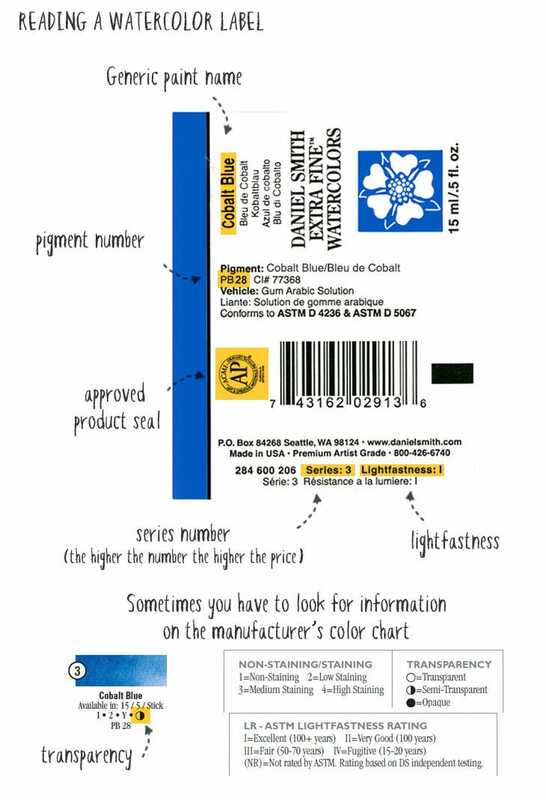 There are at least four important characteristics to look for on labels: the pigment number, the transparency rating, the lightfastness, and the staining property of the paint. The generic name of the paint is less important. Why is this information important? Because it can help you choose your paint, and give you a better understanding of color mixing. Interpreting labels might seem confusing at first but it’s actually quite simple once you become familiar with it. 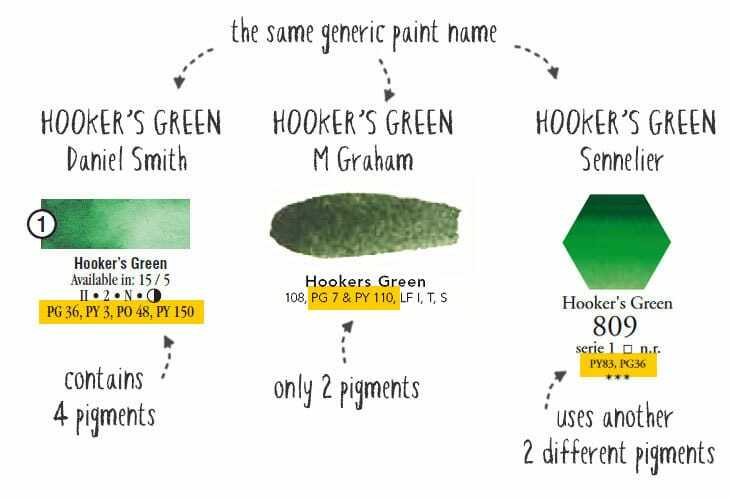 Knowing what’s actually in the paint formula will help you choose your paints with confidence. And it also helps your color mixing skills when you know which pigments you’re mixing. You’ve probably noticed the poetic names printed on your tubes of watercolor. You often see names like “Phthalo”, “Quinacridone” and “Sienna”. But those fancy names are just marketing names, and they don’t really tell you anything about what’s inside the paint. Which is why, if you’re serious about watercolors, you need to read the labels and the manufacturers data if you want to learn more about the paints you purchase. ​Labels vary from one manufacturer to another, and sometimes not all the information is available on the label itself. 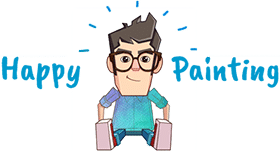 If you have the chance to choose you paints ahead of time you can generally find a complete color chart on the paint producers website. The principle ingredient in watercolor paint is the pigment. This is mixed with a few other things to improve the paint’s handling qualities, including gum arabic, glycerin, and a wetting agent. Each of these ingredients varies from one brand to another, and even if the ingredients between two brands are extremely similar, the marketing name probably won’t be the same! Manufacturers can call their products whatever they want, so don’t rely on it for comparing paints. ​So how do figure out which paints to use? ​The staining property of the paint. You’ll sometimes find other information on the labels as well, but the list above are the most important characteristics to look for. I’ll cover some of the other properties later, just so you know what they are. To make pigment identification easier to remember, paints use a code known as the Color Index Name. This is a standardized list which is internationally recognized by all manufacturers. And it provides artists with the most trustworthy way to identify colors used in paint ingredients. Pigment numbers tell you exactly which pigment was used in the ingredients. For example PB28 is traditionally used for Cobalt Blue. The “PB” means “pigment, blue”, and “28” means that it’s the 28th blue pigment listing in the color index. You also want to look at the quantity of pigments used in the formula. Paints with more than one pigment are generally known as “convenience” mixtures (more about these later). Ok… This next bit is slightly geeky, but you may ask yourself the following question when you start examining paint labels. Take the example of Daniel Smith watercolors. When you look at their color chart you can see several paint colors which use the same single pigment, but which have different color appearances. For example, the colors Quinacridone Red, Quinacridone Rose, and Quinacridone Violet all use one single pigment labeled PV19. So how can they produce different hues if they all contain the same pigment? ​The pigment number is not always a guarantee of color appearance. Pigments can exist in slightly different forms but still have the same chemical composition. So chemically speaking they are classed as PV19 but they produce different color results. Paint manufacturers can take advantage of this to produce a greater variety of colors. Thankfully, this is only the case for a few pigments. The transparency rating generally ranges from “transparent”, to “semi-transparent” to “opaque”. Yes… you’ve probably heard me jabbering about how “watercolors paints are transparent”, but different paint formulas can have varying degrees of transparency. Lightfastness is also known as permanency. This is a measure of how well a paint stands up to the strains of time, and whether it is likely to fade after a few years. If you intend to sell your paintings or want them to last several years, this is an important quality. Paints can also have low, moderate, or high staining properties. This is a measure of how well the paint fixes to the paper. For example, a low staining paint will easily “lift off” the paper (this kind of paint is known as fugitive). Conversely, a high staining paint remains stubbornly on the surface and is difficult to budge! My advice if you’re choosing your first paint is to go for single pigment paints which have the highest transparency rating possible. Also, if they have good staining properties then that can be a bonus. Color mixing is an important skill to master and mixing with single pigment formulas is much easier than mixing convenience paints which contain multiple pigments. It’s all about getting to know your paints, and mixing with the same single pigments is predictable, and easily reproduced. Different brands which use the same single pigment are likely to be very similar. However, convenience mixtures differ from brand to brand, and manufacturers sometimes use less expensive pigment combinations to match the color appearance of more expensive paint. You know what you’re getting with single pigment paints. Also, fundamental techniques such as glazing work better with paints which are rated transparent. It makes sense don’t you think? Glazing, or layering, relies on the idea that the underlying washes of paint remain visible. For me, this transparency is part of the beauty of watercolors. Similarly, if you paint in layers like this, good staining properties are useful. With staining paints the underlying layers of paint won’t lift and start mixing with each fresh glaze of paint. Artists often find that opaque, low-staining, multiple pigment paint mixes can result in muddy colors. I’m not saying that convenience mixtures are bad or that transparent paints are necessarily better than opaque. Each has its own advantages. But as a beginner, mixing multiple types of paints with highly varying characteristics and trying to learn about them is going to be very tricky. ​A note about paints which use the word “hue” in the generic name. Manufacturers like to use historical paint names such as Cobalt Blue, which is made with the pigment PB28. However, if the paint is labeled Cobalt Blue Hue, then it does not contain the pigment PB28 but a mixture of other pigments to produce a color appearance similar to Cobalt Blue. This is often done using cheaper pigments to keep costs down. This is another sticking point for some beginners, and understandably, because watercolor paint can be expensive. Student grade kits are often more reasonably priced. And there are so many beautiful pigment colors and paint formulas it can make it difficult to choose. Nowadays artists rely on the reputation of well known manufacturers for the quality of their paints. But these brands often sell two different standards of watercolors which are generally rated as “student” or “artist” grade paint. Quite simply, the difference with student grade watercolors is they use less pigment or substitute expensive pigments with a lower standard of pigment in their ingredients. This doesn’t mean that student grade paints are bad. When I was learning I used a set of Winsor & Newton Cotman watercolors and was very happy. My own preferred brand of paint is Daniel Smith. They mix smoothly and I just love the way these paints handle. A great way to get started with these paints is this introductory set of warm and cool primary colors. 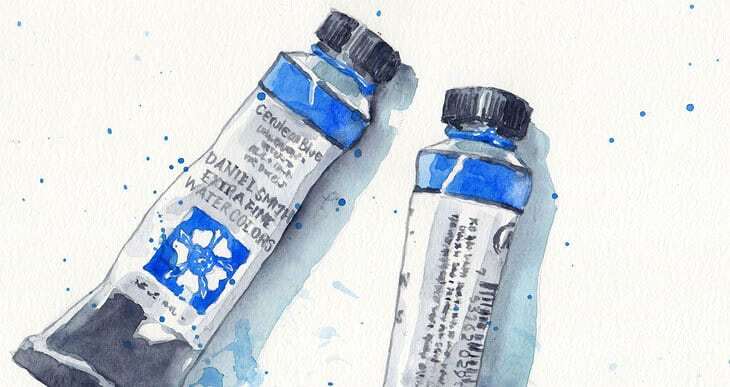 ​Watercolor paints also come in the form of tubes or pans. Each format has its pros and cons. For example, tubes tend to be more economical in the long run, and pans are compact and easily transported. Personally I go for tubes because I find there is more choice, they give me more flexibility, and work out less expensive over time. So next time you buy some paint, think about the above characteristics. You should be better able to understand the paints that you’re using and make an informed choice which watercolors you want to use!